Home » Education » Social Media: Its Efficacy in Business! The influx of social media has skyrocketed over the last decade. The on-going and increasing demand of customers online proves that the widespread existence of social media is not just a trend, but is here to prevail, permanently. Social media doesn’t only entail a place where people communicate and socialize, but is the most preferred platform for marketing for products and services. Having a presence on the various social media platforms is an indispensible form of marketing that is currently being adopted my most business entities. Constructing a business strategy with social media as an integral component, the benefits are far-reaching: it increases exposure and traffic of the website, generates considerable amount of leads, reduces marketing expenses, improves online search ranking and most importantly, develops a loyal customer base. Among multitudinal social media platforms, more than 90% businesses resort to Facebook as the primary platform for marketing their products and services. In 2016, around 67% business enterprises plan to increase the use of Facebook for digital marketing purposes, while 30% will increase marketing activations on Twitter, LinkedIn, Google Plus, etc. Targets audience more effectively- Targeting prospective customers is the key to effective growth of a business enterprise. Not only does social media helps to achieve this, but it also has tools to specifically target the demographic variables of the consumers. Social media platforms like Facebook and Twitter have tools that allow businesses to communicate the right content to the customers. For Example- if one has to send out a post for people who speak Spanish, Geo-targeting is the most effective way to do it. Allows Instantaneous Feedback from Customers- Social media platforms are most effective in gaining feedback about a product or service that is offered in the online or offline marketplace. As people voice their opinions on social media freely, it helps businesses to get an honest consumer feedback and perception about their product or service. Consequently, businesses can alter their products/services according to the needs of their target audience. Thus, providing respite from the tedious task of calling up customers or sending them emails, to ascertain their level of satisfaction. Increases Website Traffic, Search Engine and Generates Leads- The more the social media activities adopted by businesses, the more brand visibility and the better positioning of its products and services. Creating blogs and linking business activities to social media is optimally effective in directing traffic to the website. Higher traffic on website ensures more leads are generated by the company. The intention of such activities is to build future connections and increase the visibility and goodwill of the company. Builds Brand Awareness and Exposure- The primary intention of businesses adopting social media marketing is Brand Visibility. Social media may not directly generate a large amount of sales, but it does enormously create and promote brand awareness. The main purpose of social media is to build brand engagements and customer connections at a relatively low cost, as compared to traditional marketing. This is particularly beneficial for startups and entrepreneurs. Therefore, social media tends to be integral to the digital marketing strategies of business enterprises.With the digital medium fast encompassing the regular routine of all individuals and businesses alike, digital marketing has become imperative for the marketing strategies of businesses. 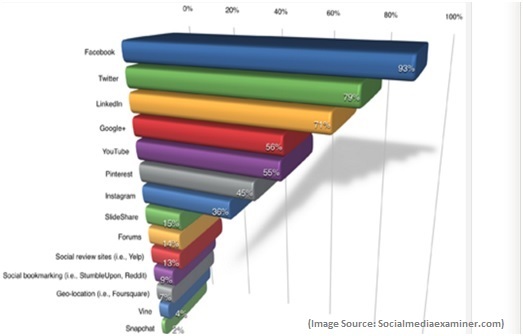 Within digital marketing perimeter, social media marketing has the strongest impact. Thus, social media with its vast reachability and accessibility enjoys widespread importance in the growth of business enterprises. Previous: Start up India, Stand up India: The Action Plan! Next: Start Up India: The Call for Budding Entrepreneurs! but I know I am getting familiarity daily by reading such fastidious articles.